The Council of Landscape Architectural Registration Boards (CLARB) is a non-profit association that diligently works to set up academic, work and assessment standards needed to become a professionally licensed landscape architect. The Landscape Architect Registration Examination (LARE) is an assessment used for CLARB licensure purposes. In this test, a candidate is required to prove that he or she can do the work and maintain health, safety and welfare standards for people in the community. 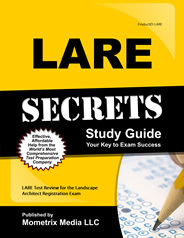 Ace the LARE test using our LARE exam study guide with practice questions. 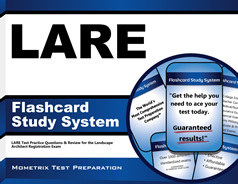 Quickly Solve Difficult LARE Test Questions with the LARE Flashcard Study System.